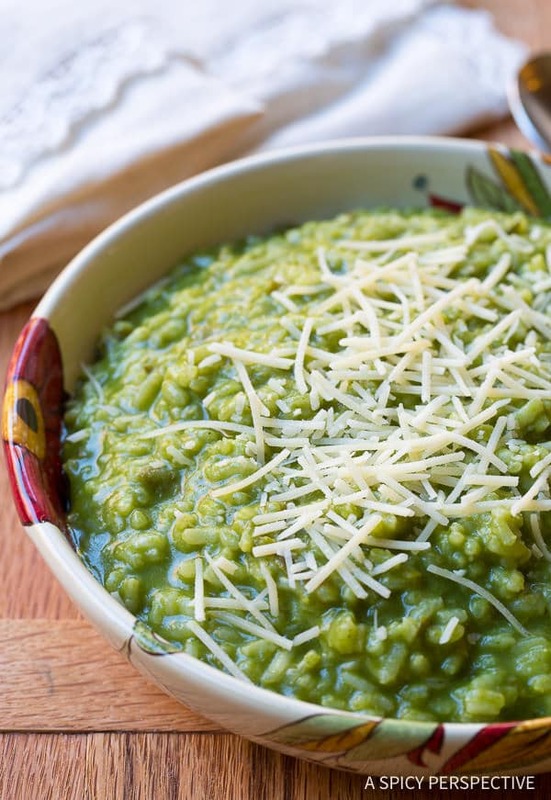 A fresh fragrant Green Risotto Recipe perfect for holiday dinners! The dazzling color and zesty flavor make any meal feel like a celebration. 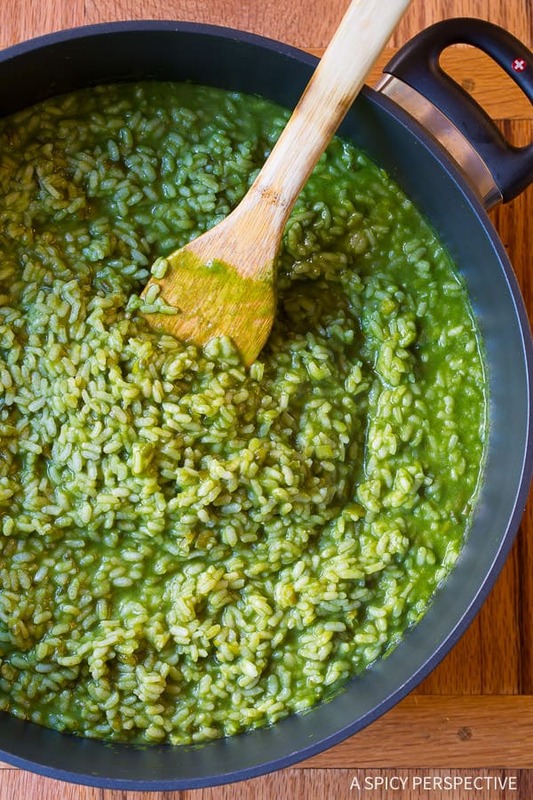 The very first time I tasted Green Risotto was in a small family-owned restaurant in Florence, Italy. It was one of the few restaurants we found in Florence that did not cater to tourists. No english on the menu. No english-speaking waiters. No pizza, spaghetti, or meatballs available. Just true Italian comfort food, without apology. We absolutely loved it! After trying to make out the menu with our limited Italian vocabularies, we glanced around the restaurant and ended up ordering by pointing at what looked good on other tables. The Pappa al Pomodoro was a standout, along with the Risotto Verde, a vibrant green risotto recipe loaded with intense herb flavor. Of course, I had to come home and make both so we could enjoy them whenever we pleased. I especially love serving green risotto at Christmas time! 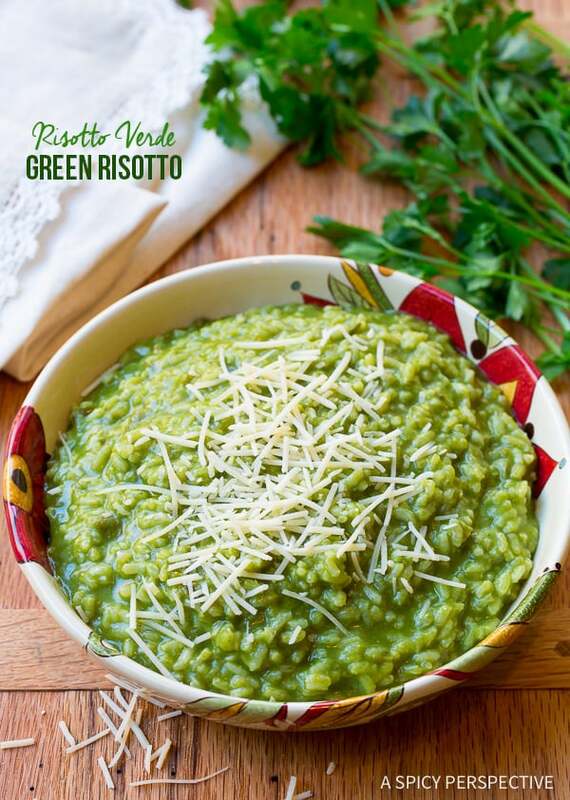 This Green Risotto Recipe is rich and creamy with a nutty essence from parmesan cheese and a bold fresh herbaceous quality. 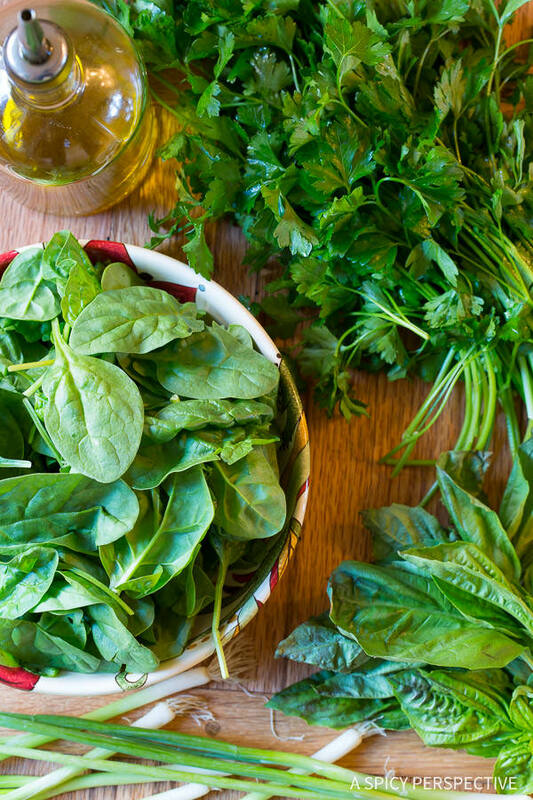 The color and flavor come from fresh spinach leaves, parsley, and basil, pureed into vegetable broth before cooking. Then the broth is added to the arborio rice, little by little, so that it slowly absorbs into the rice and creates a silky green sauce. This Green Risotto Recipe makes a marvelous platform for holiday dinners with a slice of prime beef or bacon wrapped tenderloin over the top. You can also serve it with earthy sautéed mushrooms for a vegetarian main course this season. If you like rice, cheese, and fresh herbs you are going to LOVE this dish! 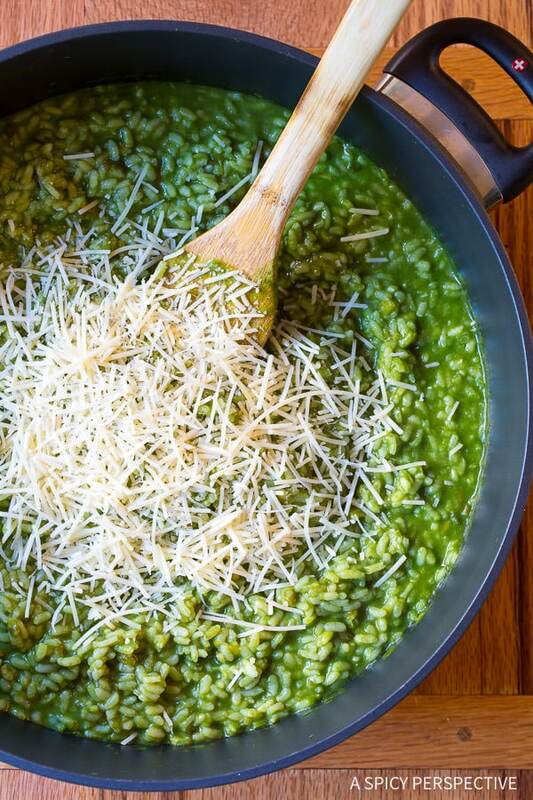 A classic Italian risotto recipe using spinach, parsley and basil to turn the rice green while cooking. It makes a great holiday dish! 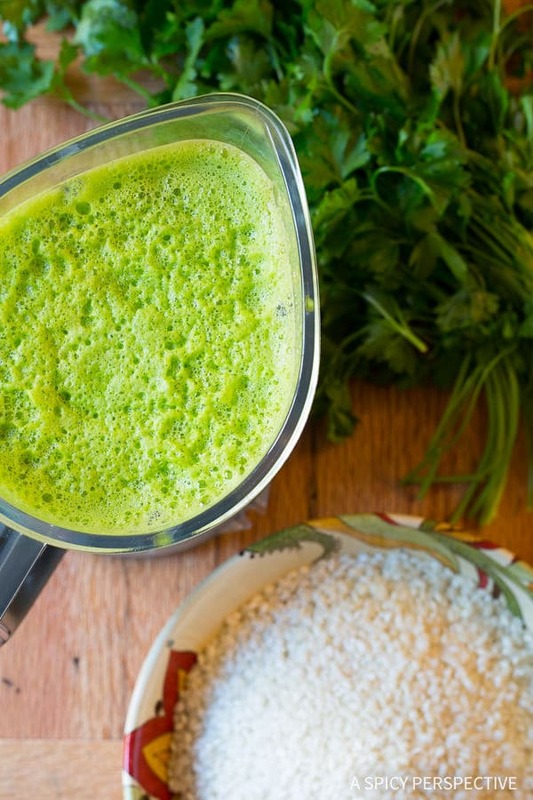 Place the spinach, parsley, basil, and garlic in the blender. Add 4 cups of broth and puree until very smooth. Add the butter and oil to a large sauté pan. Melt the butter over medium heat. Once melted, add the chopped scallions and sauté for 2 minutes. Stir in the rice and sauté another 2 minutes. Then add the wine, along with 1 1/2 teaspoons of salt and 1/2 teaspoon ground pepper. Stir and simmer until the wine has absorbed. Add one cup of broth at a time to the rice, starting with the 2 cups of broth not added to the blender. With each addition of broth, stir the rice and allow it to simmer until the broth is absorbed before adding more. Make sure to incorporate all the green herb broth in the blender. This process will take about 25 minutes. Once you’ve added the last of the green broth and the rice is tender, but still firm, stir in the shredded parmesan cheese. Turn off the heat before the last round of broth is fully absorbed so the risotto is a little soupy. It will firm up as it cools. 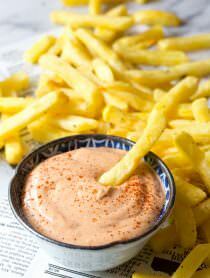 Season with salt and pepper to taste and serve warm. Oh my goodness!! 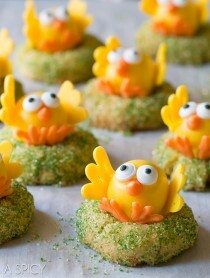 I’ve been searching for a recipe similar to this! 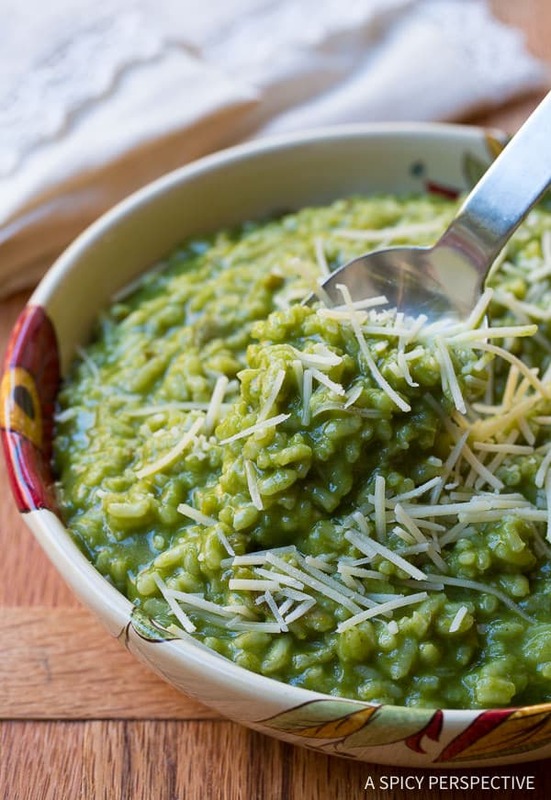 We had some amazing green risotto at a resort outside of Barcelona that looked very similar to this!! I can’t wait to try it!! I have been searching for a recipe like this for almost 2 years now, ever since I traveled to Florence in October of 2015!!!!! I was so excited when I stumbled upon this, and even more excited when I read your story. I think we ate at the same little restaurant in Florence!!!! What a coincidence! 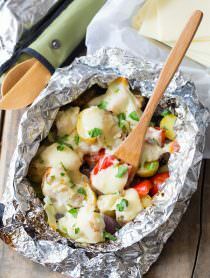 I have been dying to make a copycat of this amazing meal but haven’t had any clue where to start. Thank you so much for creating this recipe. I can’t wait to make it. Thank you again. Happy 2018!!!! That’s so great, I’m glad you found us. Let me know what you think! Hi Sommer, Made this for Christmas dinner. Flavors were wonderful. Thank you for the inspiration. The color was not as vibrant as I would have liked after cooking. Do you have any tips on keeping the vibrant herby green color? So glad you liked it! As for the color… Hmmm. I always add the last cup of green broth right at the end and then turn the heat off before it’s all the way absorbed. The color is always fairly vibrant. Is it possible your herbs were a little old? I love finding restaurants off the beaten path when I travel. A good creamy Risotto be beat. I’m looking forward to trying this! herbaceous might be my favorite new world. this sound absolutely delicious! What an amazing risotto! Love the spinach, basil and parsley combo! The color?! These flavors!! I love the basil on over drive here! This is why traveling is so amazing! It’s so different from what I’m used to thinking Italian food is. Thanks for sharing, this looks amazing.